After the Communist Revolution in 1917, the celebration of New Year and religious holidays were canceled in Russia. New Year’s revival at the state level began only at the end of 1930s, but still remained a working day. After the suffering of Russian people in WWII, Stalin needed to raise morale. By decree of the Presidium of the Supreme Soviet of the USSR of December 23, 1947, January 1 was declared a holiday and a day off. The only holiday not connected to politics, the New Year celebration quickly became the most popular holiday in Russia. After the economic difficulties of the Perestroika time, the Russian government decided to raise morale even more. Since 2013, the New Year holidays were lengthened in Russia to eight paid days (from January 1 to 8). Since then these long winter holidays, devoted by many Russians mostly to drinking, had become a subject of controversy. It has been estimated that the Russian economy loses billions of rubles during the New Year idle period. Industrial production at this time falls by 15−20%. Still, the New Year celebration was considered in Russia the happiest period of a year. Nor was their much criticism. 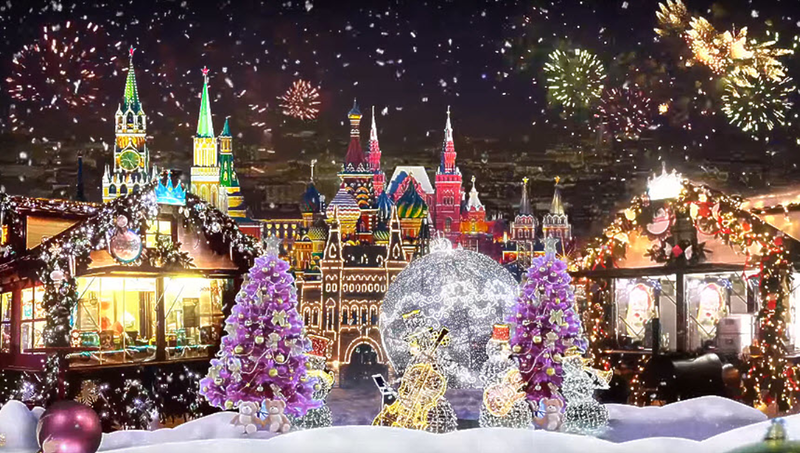 This year Moscow was decorated as conspicuously as usual, so from the first look nothing has changed. But Russian media carried some very unusual comments. “On my memory, we have never entered New Year with such anxiety. There is no joy, there is no money, and there is a firm belief that in the near future everything will be even worse. “Why be joyful? We should cry. And, you know, it seems to me that our people were doing just that in this New Year Eve. Have you looked around late in December? Have you seen the faces of people in the streets, in the stores, supermarkets? Indeed, our people began to look as if they were not going to have a New Year’s feast, but a funeral of their beloved aunt. There was some kind of grief on people’s faces, hopelessness. Mironova’s article was passionately commented upon by many on the Internet opinions were divided. Some thought that Mironova’s description of the reality is distorted, the negative details extremely exaggerated and her “lamentations” comic. Others stressed, that in spite of exaggerations, there are quite a few facts of Russian life that justify the journalist’s emotions. Usually, not many serious commentators trust the official Russian statistics. They believe that official government organizations don’t tell the truth. Besides it’s well known, that many of the ordinary Russian respondents, when they feel negative toward government, rarely reveal it to researchers. Nevertheless, this time even official reports did not look as optimistic as usual. “Almost half of Russians finished 2018 with optimism, according to the survey by the National Public Opinion Research Center. “Russians sent off the 2018th with a good mood in general. On the eve of 2019, 49% of respondents felt joy and expectation of change for the better, 27% – felt calm and confident,” the report said. Although 57% of respondents called the past year “good” or “successful” for themselves and their families, 40% reported that problems prevailed in their lives or that the year was difficult. Nineteen percent of the respondents felt “tired”,comparing to 8% last year, feeling “nervousness” increased from 10% to 15%, feeling “sad” from 4% to 10%, and “frustrated” from 3% to 10%. The poll also showed that this year Russians had reduced their spending for celebration of the New Year’s holidays by 4%. On the Eve of the New Year respondents as a group indicated their average holiday spending will be 13,700 rubles ($228), compared with 14,300 rubles last year. The vast majority – 87% – set aside 5,000 rubles ($83) for gifts, as apposed to 5,300 rubles, which were set aside in 2017. Only 21% of respondents believed that the year 2019 will be a good one for them personally. Only 13% believed that the year 2019 will be a good one for the country.